zeb.control.regulatory - Solvency II supports all three Solvency II pillars in an integrated end-to-end process and has been proven with several international insurance companies. 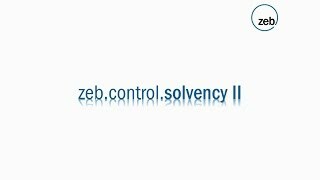 With zeb’s Solvency II software the fulfillment of all regulatory requirements will run smoothly and with minimal effort. High flexibility of the system and company-specific parameterization allow for individual configuration of the software based on your particular company. Comprehensive analyses and simulations required by national supervisory authorities in the EU can be conducted by the use of zeb.control.regulatory - Solvency II. In future, competence in risk capital management will become the decisive competitive factor for any insurer. Even today, rating agencies and customers increasingly assess insurers based on their management competence and Solvency II ratio. zeb.control.regulatory – Solvency II supports economic corporate management and risk management. This ensures that the requirements of pillar 2 are met. Using the scenario manager, comprehensive analyses and simulations can be conducted. For example, risk parameter shifts in all risk types can be simulated. The entire reporting process is calculated automatically (standard model according to pillar 1) and an automated report is generated in XBRL format. Insurance companies benefit from efficiency gains thanks to these fully automated calculations. Fewer staff members are required and the error rate is reduced significantly. zeb.control.regulatory – Solvency II maps the entire Solvency II regulatory reporting of solo insurance companies and groups as required by national supervisory authorities in the EU (requirements in pillar 3). The multi-currency capacity and multilinguality of the entire system (reports, user navigation, documentation) enable its use in international insurance companies. The pre-defined, audit-proof and documented zeb.control process/workflow model can be adapted individually according to company requirements. The entire process chain is mapped in full compliance with regulatory requirements within the zeb.control environment, including pre-calculations. All processes and process steps are automatically logged and a role/rights concept as well as an approval system using the 4-eyes-principle are included. Thus, zeb.control.regulatory – Solvency II complies with the audit and regulatory requirements regarding data quality, data security, traceability, completeness and documentation. Due to the parameterizability of the system, company and business structures, responsibilities, etc. can be flexibly mapped (incl. historization and storage). It is possible to integrate individual calculation functions (e.g. for partially internal or internal model modules) and feeder systems. Additionally, there are individual configuration and expansion options for reporting, process management and user management as well as the calculation engine available. InsuranceERM nominated zeb as finalist for last year's InsuranceERM Awards. Therefore, you can find zeb with its software zeb.control.regulatory – Solvency II amongst the finalists of the technology area within the categories “Best Solvency II solution” as well as “Best regulatory reporting software”.